My eight year old son Joe is a huge fan of Annie – and now his 51 year old dad is too! What a wonderful production of this stage favourite, full of fun, energy and outstanding performances! OK, yes, I was slightly nervous when my eight year old asked if he could go along to see Annie on stage at the Hippodrome. My concern was based on the idea of an evening of sickly sweet songs and percocious performances, kind of a modern version of Shirley Temple. I was so wrong. Right from the start this was a wonderful production of a thoroughly deserved musical classic. The action starts in the dingy dorm-style bedroom of Miss Hannigan’s home for orphans and within no time the super-talented troupe of young actors are bringing the theatre to life. The energy, professionalism and just down right skill of these performers is incredible, moving, singing and dancing with a wonderful confidence that is joy to watch. Freya Yates in the lead role of Annie is an absolute star, with a voice and personality that rightly demands the spotlight, but enough clever stagecraft so as not to come across as if demanding ‘look at me, look at me’. 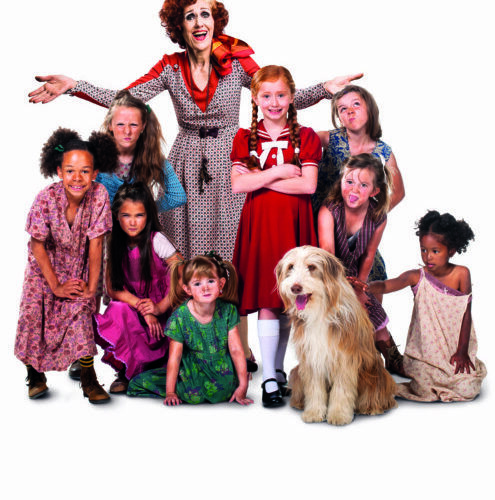 Of the grown-ups, perhaps the biggest name is Anita Dobson as Miss Hannigan, giving a wonderfully over-the-top performance as the children’s drunk and most uncaring of carers. Yes, the actions are exaggerated and perhaps even a little pantomime, but you know, it works so well. Where Miss Dobson struggles a little in the dance pieces, she’s great as the least loving of guardians who is more interested in her stock of gin than the welfare of her wards. Elsewhere, the rest of cast are similarly perfectly placed. This isn’t Alex Bourne’s first turn at Daddy Warbucks and his experience shows, bringing a suitable gravitas to the role of the billionaire businessman who falls for the charms of little orphan Annie. Throughout the plot is spiced up with gorgeous period dance routines, some of which could certainly last a little longer. Certainly I would have loved a little more of the tap dancing on the fruit boxes. Still, with great songs to singalong with, a clever use of stage space and design, and even a cute doggy to coo over, this is a thoroughly enjoyable piece of family theatre.